I’ve been banned from forums! Help! I have a question. Where should I post it? A AT stands for "Active Topics." AT can be found by tapping on the Active Topics button when first logging into forums. Only the top 25 recently active threads will appear in AT at a time. A thread is considered active when someone has posted in it recently. To bring a thread into AT, simply bump it. Q Why did my thread get locked?! A Threads may be locked for excessive off topic posts, lack of effort in the OP, or RoC/ToU violations in the thread. If your thread gets locked, you may not complain about it in forums. If you feel your thread was unfairly locked, you must send an email to support@athinkingape.com and explain why you think your thread should be unlocked. A BBCode stands for "Bulletin Board Code." It is a programming language that is used by this forum to add formatting to your posts and threads, such as bold font, color, and different sizes, just to name a few. I want to try testing some BBCode. Where can I make some test posts? How do you make bold/underline/color/italics? Q What do I need to know before I make my first post in forums? A Before you make your first post in forums, it's a really good idea to lurk for awhile to get a feel for how to conduct yourself here. Take note of the way others are posting and decide how you want to present yourself here. Show your unique personality, but remember to always follow the RoC and ToU when posting here in this forum. I’ve been posting awhile now, and I think I’m ready to make my first thread. What should I do? Why can’t I post on kaw_admin threads? How do I find my post count? AA troll is someone who makes others think they are a certain way without actually feeling that way. Their intent is to bait you into a heated discussion to get you angry and make passionate comments. A good troll never gets caught. However, trolling is against the RoC and may earn you a forum ban. True trolls are VERY rare, and you'll likely never know that you're dealing with one, if they're worth their salt. A flamer is someone who makes inflammatory comments to upset you. Unlike a troll, their intent is clear - they want to upset others. Flaming is a violation of the RoC and ToU and may get you banned from forums. Do not flame this forum. Nobody likes a flamer. If you want to flame, go elsewhere. Keep your posts on topic and make sure that what you say contributes to the forum. This doesn't mean you have to pretend to be friendly. You can disagree and debate without flaming. Debate and disagreements are welcome here, but when you disagree for the sake of disagreement, you've crossed the line. Last edited by Imitation-Cheese on Jan 30 2014, 1:54am, edited 10 times in total. I’m being attacked by someone waaaaay bigger than me! That’s not fair! Here is a thread that you may find useful if you feel like you're being bullied. Last edited by Imitation-Cheese on Jan 29 2014, 8:21pm, edited 6 times in total. Q What’s the biggest EB I can hit for my size? A Follow the above link for the ongoing discussion to nail down the answer. I don’t know what to do next in this EB. What should I do? Last edited by Imitation-Cheese on Jan 30 2014, 2:29am, edited 3 times in total. Where can I find a war clan? Last edited by Imitation-Cheese on Jan 30 2014, 12:32am, edited 7 times in total. QWhere can I find a list of active clans? A From the home screen, select Clan, then select "Clan Events" in the bottom, right corner. Or look for clan ads posted in WC. Where can I find a list of war clans? Q Where can I find an epic battle clan? Q I want to do ____ epic battle. Where can I find a clan doing it? Q What is a clan bonus? A When a clan successfully unlocks a new EB, they may earn a clan bonus. This bonus is a percentage stat boost that applies to everyone currently in the clan. You can see your clan bonus by opening your profile and scrolling down to "Clan Bonus," as shown in the SS below. Q How do I create a clan? A To create a clan, you must leave your current clan. Then select "Clan" from the home screen and then select "Create a Clan." 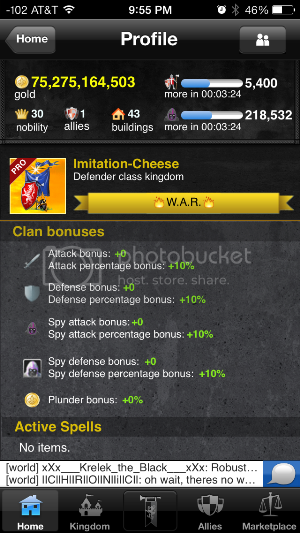 As of the writing of this post, the current cost to create a clan is 25 billion gold or 100 nobility points. Q Should I create a clan? A Chances are that if you're asking this question, you probably should not. Owning a clan and making it work requires a great deal of time and effort. Most clans, like most small businesses, fail within a few days/weeks. Unless you have a strong support network of friends who are willing to devote time and effort to help you run your clan, it will likely fail. It's best to spend a few months in other clans and grow your account before deciding whether you really want to create your own clan. How do you perform admin/owner duties? My clan is failing. What should I do? How do I let more people know about my clan? My clan is being attacked! Help! How do I disband my clan? What happens if I disband my clan? Last edited by Imitation-Cheese on May 1 2014, 8:15pm, edited 9 times in total. If you have a complaint about another player, and you feel that they have violated the RoC or ToU, you may file your report to a moderator, send feedback through the in-game feedback function located at the bottom of the home screen, or you may send an email to support@athinkingape.com. Remember - farming is not against the rules, so do not contact a moderator, use the feedback function, or email support with farming complaints. Find a way to get a CF or fight back. If you have complaints about the game, you should first discuss it with your friends and clanmates. If you feel like your complaint is legitimate based on their feedback, you may post your complaint in forums. Make sure you post your complaint in the correct category, or your thread may get locked and/or deleted. When posting complaints in the forum, be prepared for a MUCh bigger variety of feedback, which may include people who disagree with you and your friends about the issue. Don't take this personally, as KaW is a very big game, with players from all different backgrounds and all over the world. If after making your thread, you have found that your complaint is valid, you should send an email to support@athinkingape.com with a link to your thread and a well-written explanation as to why you think the developers should consider your complaint. Last edited by Imitation-Cheese on Jan 30 2014, 1:12am, edited 3 times in total. Last edited by Imitation-Cheese on Jan 30 2014, 10:43pm, edited 6 times in total. •	I have an idea that I think will make the game better! What should I do? Last edited by Imitation-Cheese on Jan 18 2014, 3:38am, edited 1 time in total. Where can I find a list of moderators? Q How can I contact a moderator? A To contact a moderator, simply select the link above for the list of moderators and post your question on their wall. I want to become a moderator. How do I apply? Last edited by Imitation-Cheese on Jan 30 2014, 2:30am, edited 4 times in total. Q What is a dev/developer? A Developers are the people (and their managers) who write the computer code that makes this game work. kaw_admin is the public face of the development team. Developers are considered by most the top of the ATA food chain, although this may not necessarily be true. ATA is a private company, so they are not required to publish any information regarding their company structure or management. Q I just sent an email to support@athinkingape.com. Who reads these emails? A Your emails are typically read by a customer service representative of ATA. Once they receive your email, they forward it to the appropriate department that deals with your particular issue. Sometimes, this may mean it goes to a developer. Other times it may mean your email goes to an account specialist if you're trying to have some work done to your account. Most of the time, however, the customer service representative will send you a response to answer your question or relay a predefined response to common questions and complaints they receive. Understand that they get many emails throughout the day, so you may not always get the answer you're looking for. Repeatedly emailing them may get your email address added to their ignore list, which will prevent your from ever getting help from them. When you send in an email to support, be sure to write clearly and use proper grammar and spelling to ensure that the person reading your email fully understands your issue, so they can server you better. Q How can I contact the developers? A There is no way to contact the developers directly. Your best bet to contact a developer is to send an email to support. If the customer service representative doesn't have an answer for you, and if your question is related to game development, there is a chance that you may actually get a response from a game developer, but they won't necessarily identify themselves as a developer. The only thing you'll see is the name of the person sending the email. No job titles are listed. I have feedback I’d like to share about the game. How can I submit my idea? Last edited by Imitation-Cheese on Jan 30 2014, 2:31am, edited 3 times in total.